Sorry, these Irish rosary beads are not sold out. 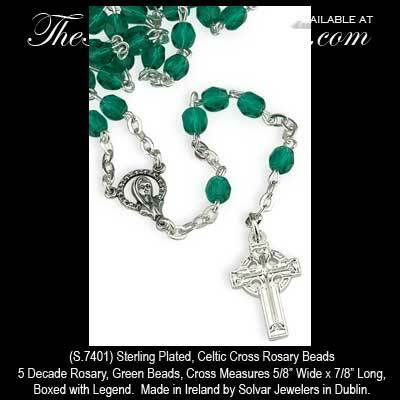 This Irish Rosary, like all the Irish made jewelry at The Irish Gift House, is nickel free and hypoallergenic. These Irish rosary beads include a silver plated Celtic cross that measures 5/8" wide x 7/8" tall and it is enhanced with embossed knot-work. The 5 decade rosary features petite green beads and it is made in Dublin, Ireland by Solvar Jewelry. The green bead rosary is gift boxed with Celtic knot and Celtic cross history cards that are complements of The Irish Gift House.